Good morning Chicago Blackhawks fans! The Super Bowl was last night, and if you turned it off at after the halftime show you missed a historic comeback which made me think back to some of the Chicago Blackhawks great comebacks in Stanley cup Final games. One thing is for sure, the Atlanta Falcons made some real sketchy decisions with the football to give Tom Brady and the New England Patriots a chance to make that very entertaining comeback. Of course anytime you think of great comebacks when talking about the Chicago Blackhawks in Stanley Cup Final games you have to go right to Boston and 17 seconds! That still is one of the most shocking and craziest finishes ever. In the final two minutes both Corey Crawford and Tuukka Rask were pulled because their teams were trailing in the final two minutes of the third period. Of course, this game is way better as a Chicago Blackhawks fan than a Boston fan, but no one is really feeling bad about Boston today. 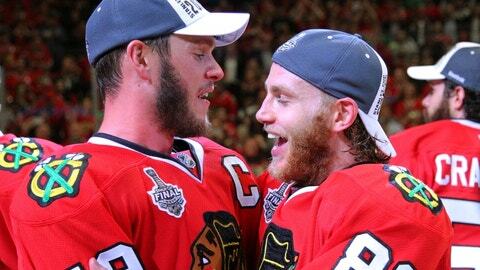 Tom Brady won his 5th Super Bowl which makes me ready to celebrate another Stanley Cup in Chicago. The football world outside of Boston despises Brady which is the same thing that I feel most fans outside of Chicago (and some inside) feel about Patrick Kane, but I wouldn’t have a problem with him skating around with the Stanley Cup over his head another time or two. For that to happen this year they need to figure out the their new third period collapses, but luckily there is still time for that. Here are some Chicago Blackhawks morning links to start your work week.